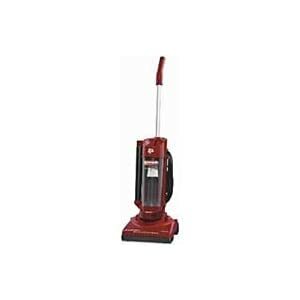 The Dirt Devil Dynamite Plus upright vacuum offers consumers an upright model with a convenient lightweight design. The unit weighs in at less than 8 pounds total, making it an ideal option for elderly individuals or anyone who may have trouble carrying a heavier vacuum cleaner. It includes the Dynapower design, which his listed at a 26.0 cleaning effectiveness rating. It is designed to handle both carpeting and smooth flooring with equal effectiveness. Dirt Devil created the Dynamite Plus upright vacuum as a simple solution for everyday household use. It comes with a handful of features, including an easy to empty dirt compartment and effective HEPA filter system that can help improve overall air quality in the home. Each time the vacuum is used, the HEPA filter will help remove dirt and debris and reduce the amount of airborne allergens that make it back into your home. The Dynamite Plus upright vacuum is packaged with a stretch hose and basic on board tools that can be easily stored with the unit, eliminating the need for a separate container. A 30 foot power cord offers a sizable reach so consumers have to unplug and plug the unit less often when vacuuming multiple rooms. What did customers who bought Dirt Devil’s Dynamite Plus upright vacuum like? The lightweight design makes the Dynamite Plus upright vacuum easy enough for a small child to use. It’s a great choice for older individuals or anyone who has experienced trouble lifting larger models. Powerful suction helps the Dynamite Plus work effectively without the need for a larger model. The handle is designed to retract so the Dynamite Plus is very easy to store in a small space. Dirt Devil’s Dynamite Plus vacuum works on many different types of debris, from sand to pet hair and dirt. It’s a great choice for homes that include children or pets. What did Dirt Devil’s Dynamite Plus customers dislike? The noise output on this unit is rather high, which can make it unsuitable during certain times (such as vacuuming in the evening when others may be sleeping). Noise can also disturb napping children or frighten pets during use. Exhaust is blown out of the Dynamite Plus upright while in use which can kick up dust and blow light objects around while vacuuming. The Dynamite Plus does not offer a very low profile, which can make it difficult to slide under furniture and other objects in the home.